Free Honolulu Entertainment: A Visitor’s Guide. 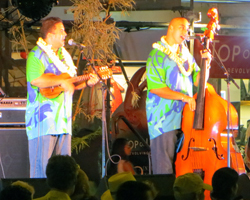 Free Honolulu Entertainment: Get Your Groove On! Treating yourself to some island-style Hawaii entertainment is a key ingredient of any great Hawaii vacation experience. And since these pages are all about free things to do in Honolulu, I want to tell you about some fun and free Honolulu entertainment. Hawaii is world-renowned for its unique brand of music and dance. Almost everywhere you go on Oahu, there are music concerts, hula performances, luau shows, and more. Many of these performances require paid admission (and they are very worth the cost); others require patronage of a restaurant/bar. Meanwhile, however, some are absolutely free and ideal for your Honolulu tourism enjoyment. 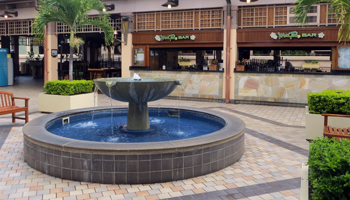 Hawaii’s largest retail mall, the Ala Moana Shopping Center, is located just outside the western edge of Waikiki; and it’s reported to be the largest open-air shopping mall in the world. 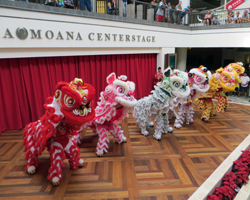 Due to its prominence and proximity, this Hawaii shopping Mecca often seems to be packed with more Hawaii visitors than residents; which makes this the ideal location for some Hawaii tourism-oriented Honolulu entertainment. 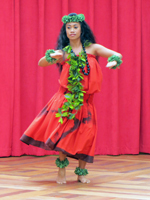 Thus, every afternoon at the Ala Moana Center Stage, you can witness more than 100 years of Hawaiian hula dance history in just 20 minutes of fast-paced, fun and frivolity. 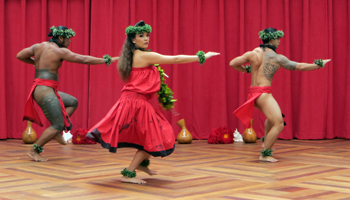 This well-composed Hawaii hula dancing exhibition starts with a traditional hula kahiko – the ancient style of hula performed before contact with the western world (my personal favorite style). Then it quickly jumps forward in time to the glitzy hapa haole (western hybrid) hula of the 1950’s. Following that quaint period of pseudo-hula, the performance progresses up through modern times in a variety of styles and costumes, and even with a little flair. For example: during the holiday season, they dance to Hawaiian Jingle Bells as “snow” falls on everybody below! It’s not necessarily a competition-quality hula performance, but it’s good, it’s fun, and it’s free. And unlike the torch lighting ceremony and free hula show at Waikiki Beach, this performance happens every day without fail. So if you only have one free day, you don’t have to worry. The show will go on. It is, however, considerably shorter than it’s Waikiki Beach counterpart. 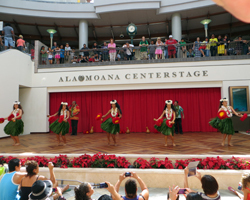 In addition to the daily hula performance, Ala Moana Center Stage also plays host to numerous other forms of free entertainment throughout the year. There are musical acts, other types of dancing, talent shows, dramatic performances, and more! Then you can go up to the Mai Tai Bar on the top level of the Ala Moana Shopping Center. This open-air bar is in a great location with a pleasant atmosphere, and it has free live entertainment every night of the week! Entertainment usually starts every afternoon at 3:30 or 4:00 and varies between live televised sports and live music on the non-sports days. Then from 9:30 p.m. to 12:30 a.m., you can hear music from a variety of live local bands and DJ’s. Of course you’re welcome to go in and get some food and drinks; but if you’re just looking to sit a while and overhear some free Honolulu entertainment as you enjoy the evening air, you can do that too. There are nearby benches outside the bar. 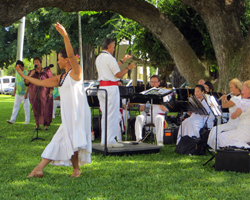 On most Fridays (weather permitting) from noon to 1:00 p.m., and on some Sundays, at the Iolani Palace grounds, the Royal Hawaiian Band performs a free concert for the public. 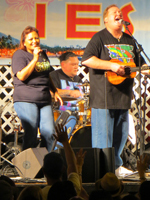 They play a variety of traditional Hawaiian tunes, big band classics, and modern hits. As you would expect, the music is very enjoyable. But what makes this band truly unique, is that it’s the oldest municipal band in the United States; and it’s the only one founded by a ruling monarch. You’ll also find free Honolulu entertainment at many of the various special occasions on the Hawaii event calendar – block parties, hula exhibitions, cultural events and more. Basically, there are multiple free entertainment options every day, week, and month. And like I mentioned above, there are also a lot of great paid entertainment performances as well. It’s just up to you to decide which one(s) appeal the most to you.